Here is a Black Hole eating a Star ! A giant black hole has been caught red-handed in the act of guzzling a star in a galaxy 4 billion lightyears away in Bootes constellation. This is the first time astronomers have seen the whole process of a black hole eating a star, from its first to nearly final bites. It is believed that super-massive black holes are located at the core of every galaxy. For example, the Milky Way galaxy in which our solar system resides has a dormant super-massive black hole at its centre. Some blackholes are thought to be more active than others. Active black holes drag surrounding material into them, heating it up and causing it to glow. Dormant black holes, like the one in our Milky Way galaxy, hardly make such a glow, so they are difficult to study. Such an event like an unsuspecting star wandering too close to a dormant black hole is thought to happen about once every 10,000 years in a typical galaxy. 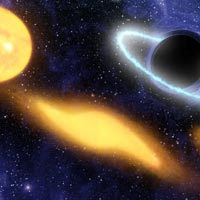 In such a situation, the star gets flattened and stretched apart due to tidal gravitional force, when the black hole's gravity overcomes its own self-gravity. Once a star has been disrupted, a portion of its gaseous body will then be pulled into the black hole and heated up to temperatures that emit X-rays and ultraviolet light. Scientists used Nasa's Galaxy Evolution Explorer, an orbiting telescope sensitive to two bands of ultraviolet wavelengths, to detect an ultraviolet flare coming from the centre of a remote elliptical galaxy. Scientists said in this case the unfortunate star strayed a bit too close to the black hole deep inside the galaxy, and was mutilated by the force of its gravity. They believe that parts of the star swirled around and then plunged into the black hole, which sent out the bright ultraviolet flare that the satellite detected. The newfound feeding black hole is thought to be tens of millions times as massive as our sun. Scientists looked at the galaxy in 2003 and there was no ultraviolet light coming from the galaxy at all. And then in 2004, they suddenly saw this very bright source. The only way to explain such a luminous ultraviolet flare is if the black hole swallowed a star. Additional data from 'Chandra'-- the x-ray telescope in space, the Canada France Hawaii Telescope in Hawaii and the Keck Telescope, also in Hawaii, helped the team chronicle the event in multiple wavelengths over two years. "Ultraviolet Detection of the Tidal Disruption of a Star by a Supermassive Black Hole"